Start planning! 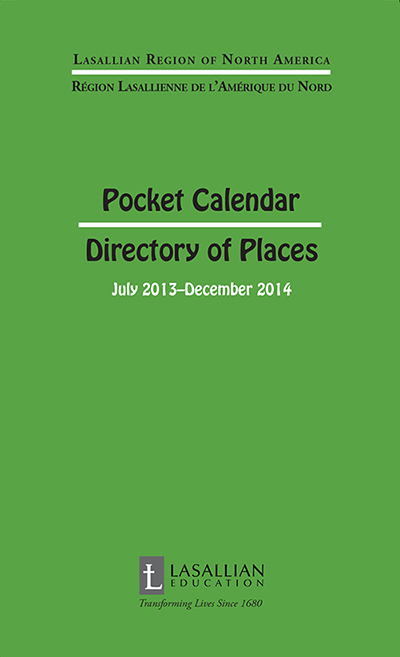 The July 2013 – December 2014 Lasallian Pocket Calendar and Directory of Places is now available! This easy-to-tote publication includes important dates including Lasallian feasts, along with Catholic and legal holidays in the United States and Canada. It also features inspirational quotes each month from St. John Baptist de La Salle in English and French. The directory lists the complete contact information of each Lasallian school/ministry and community in the Lasallian Region of North America and in the Lwanga District in Africa.